Pumpkin Spice Shortbread Cookies - Perfect for Autumn, Halloween, Thanksgiving, and Christmas. 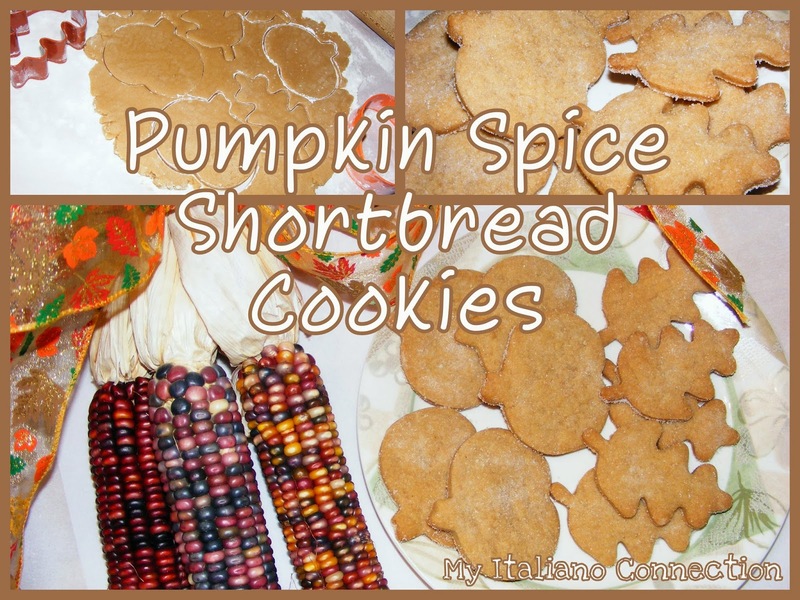 With autumn making it's beautiful arrival, the temptation to bake with warm spices lured me to the kitchen. I needed a cookie recipe that would keep a very defined "imprint" through the baking process and taste delicious. If you have ever baked imprinted cookies, you know the traditional sugar cookies don't live up to that expectation. Shortbread cookie dough is the way to go. Now I do like shortbread, but it's just a tad bland for me. I did not think it would go over well with my family either, from previous times when I have bought Walker's Shortbread from the store when we are celebrating Christmas in Scotland. I decided to design my own recipe, but lest I take full credit, it is based off an excellent standard Shortbread Cookie recipe from Ina Garten. She does an excellent job of nailing the "perfect amounts," whereas when I cook/bake, I tend to throw some of this in, and toss in some of that. When somebody asks me for a recipe, I have to try to guesstimate how much I used of each product. Sometimes, that does not work out well for you. 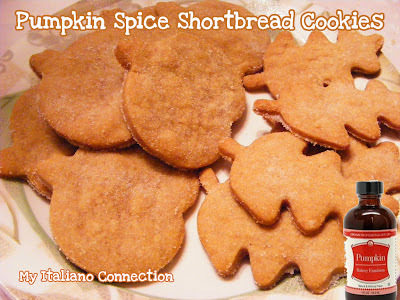 I used LorAnn Professional Kitchen Pumpkin Spice, Bakery Emulsion for part of the flavoring. It worked out delicious in these cookies. However, I tried adding it to some ice cream and the flavor was so disgusting, it was no longer edible. I would use it again in cookies, but never again in Ice Cream. I buy my LorAnn Bakery Emulsions from Ross Department Stores for $2.99 per a 4 oz bottle. You can also purchase it online through Amazon, LorAnn Oils, and possibly at cake decorating stores. So without further ado, here is the scrumptious recipe. In a bowl, mix together the butter and 1 cup of sugar until they are just combined. Incorporate the pumpkin emulsion and spices into dough. Add flour and mix until the dough starts to come together. Cover in plastic and chill for 30 minutes or until firm. Roll the dough 1/4-inch to 1/2-inch thick and cut with flour dipped cookie cutters. Place the cookies on a parchment paper lined cookie sheet and sprinkle with sugar, if you are not planning to use icing on them. Bake for 8-15 minutes (depending on actual thickness of dough), until the edges begin to brown.